Honda isn't really known for its mid-engine cars or all-wheel drive systems. This car is a rarity: One of Honda's few mid-engine cars and it's one of Honda's relatively few AWD cars. It's also small enough to fit on most freight elevators. It's the Honda Z from 1998-2002. Just look at it. This thing rocks. I'm so fascinated by this car because it's one of the very few examples of a type of car design I always thought there should be more of: A mid-engine car that's not an exotic two seater, but rather a 4+ seater everyday-use car. There's been remarkably few of these over the years — you could argue the Tesla Model S is one, and certain vans like the Toyota Previa, but hardly any conventional passenger cars. VW almost replaced the Beetle with a fascinating mid-engine hatchback, but that was never to be. In fact, the 1998-2002 Honda Z may be the closest car to that stillborn VW. The Honda Z is a tiny kei-classed hatchback, meaning it's under Japan's microcar restrictions that keep the engine size and power to 660cc/63HP and it has to fit certain diminutive size restrictions. Honda pegs both the engine size and power with their turbo inline 3, and manages to add a full AWD system in the process. The rugged-looking little hatchback isn't just some anemic city car, but actually a little go-anywhere utility vehicle. It's got a high ride height, and thanks to placing the engine under the back seat, there's a big hatch in the rear, while under the front hood the spare tire and a handy storage locker are affable roomies. I love this little Honda because it's that incredible combination of wildly unorthodox engineering that isn't weird to be weird, but because it's steadfastly the most rational way to do things. 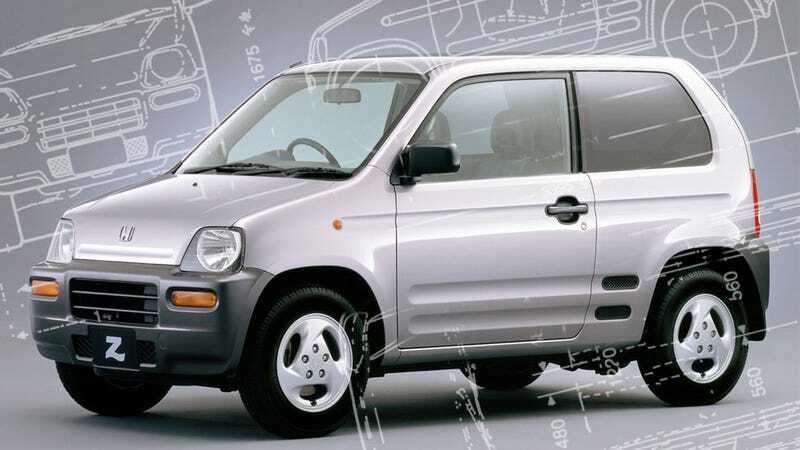 If you're going to make a kei car with all its draconian size restrictions, it's your duty as a car designer to make as much of the space in the car usable for the driver and their pals and crap, and the Honda Z does just that. As if all this hyper-efficient packaging wasn't enough to engorge your desire glands and fill your want bladder with raw covet-bile, get this: ZZ Top did their ads. Yep, playing off the common use of the alphabet's caboose, the bearded, guitar-rotating fellas of ZZ Top acted as spokesbeards for the car in Japan. The ad campaign looks like it went far enough to merit special Honda Z logo-shaped guitars, which is pretty much the ultimate quality endorsement. Guys make a noise drivin'! Try it, now! try it, now! But I won't give up Z! Hold it now! Hold it now! I want you so bad Z! I can't be the only one smitten with the Swiss-army knife appeal of this little thing. Honda really should take a good look at this design, and, appropriately scaled-up for us tubby Americans, introduce it as the next Element. Maybe four doors, enlarge that front trunk/locker, and possibly a little jog in the roof over the back seat like the Nissan XTerra to subtly hint at the engine location. That'd be deep-fried gold. Honda, you know how to contact me.